WHGT publishes a regular newsletter as the "WHGT Bulletin". Branch committees also publish newsletters and other publications. WHGT has over time published Trafodion and Gerddi. An index for articles in the Bulletin, Trafodion and Gerddi can be found here. The Bulletin is a regular newsletter for WHGT members. The latest issue is here. The Bulletin is edited by Glynis Shaw to whom items should be sent. All back issues are available here, together with two early newsletters. A bibliography of early editions can be found here. Gerddi was an occasional peer-reviewed publication produced by the WHGT. 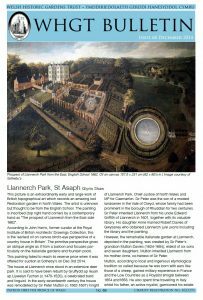 It featured topical research on historic parklands and gardens in Wales and beyond. It is no longer produced. Edited by Bettina Harden. There have been two issues of Trafodion which can be downloaded using the links below.